Little information is known regarding the life and training of Jan Jansz. van de Velde III. Born into a family of artists, his father was a well-known printmaker who produced landscapes and urban views. His son, however, focused on still lifes with foodstuffs and smoking materials such as pipes, tobacco and ashtrays. Van de Velde’s compositions tend to be simple with only a few elements and are painted with a delicate chromatic range. The present canvas was described as a work by Willem Kalf in the catalogue of the exhibition held at the Neue Pinakothek in Munich in 1930. The painting had previously entered the Collection with this attribution, which was subsequently revised in the various catalogues of the Collection by Rudolf Heinemann, and it was ultimately attributed to Juriaen van Streeck. This suggestion was confirmed by Ebbinge-Wubben in 1969, whose text on the painting noted the similarities between this painting and various works by Kalf but stated that the present work lacked the “depth of colour and warmth of lighting” typical of that artist. Van Streeck was born in Amsterdam in 1632 and specialised in still lifes, executed using a style and approach to composition close to Kalf. However, when he analysed the various objects in the present composition, Gaskell rejected the attribution to Van Streeck and suggested Jan Jansz. van de Velde III. The earliest known reference to the painting is in Paris with the dealer Charles Sedelmeyer. Around 1890 it was in the Berlin collection of James Simon and was included that year in an exhibition at the Königliche Akademie in Berlin in whose catalogue it was tentatively attributed to Kalf. The canvas was later with Frederick Muller and with Jacques Goudstikker, from whom it was acquired for the Collection prior to the Munich exhibition of 1930. 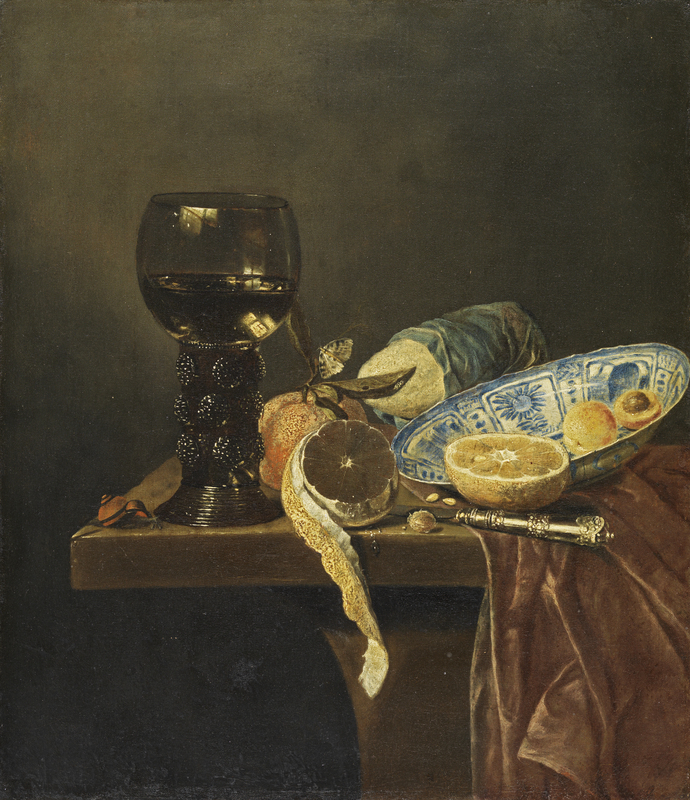 This simple still life includes a device habitually found in Van de Velde’s work, namely the presentation of the objects in one corner of a table. In addition the artist aligned them through two diagonals that converge on the very edge of the tabletop where a snail slowly advances towards the base of the rummer. Using a plain background illuminated from the left, Van de Velde used a limited range of colours to create the group of objects and foodstuffs on the brown cloth. A Chinese dish in blue and white, late Ming porcelain similar to the one seen here has been identified in other paintings by the artist now in The Hague and Amsterdam. There are also similarities between the rummer seen here, on which the artist carefully painted the reflections of light on the glass, and one in a painting by Van de Velde in the Rijksmuseum, Amsterdam.